The great Morecombe and Wise would always finish their shows with some wise words, a request to bring them ‘fun, sunshine and love.’ And in an uncertain world a bit of laughter can never go amiss, a bit of joy is just the tonic for all lives ills and worries. 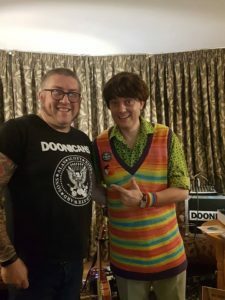 And in this case, an evening in the company of Scott Doonican, erstwhile member of Barnsley’s finest and hardest working comedy band The Bar Steward Sons of Val Doonican, is just what Eric and Ernie would both appreciate and recommend. Scott, being the consummate performer, started the performance from the moment the doors opened on a fabulously intimate room in the Green Man pub in the Warwickshire village of Long Itchington playing a selection of 45rpm records on an old fashioned record player; from the cheesy to the cool, the singalong and the laugh out loud. The scene was set, the atmosphere was expectant and the crowd warmed up beautifully for nigh on three hours of that special brand of Doonican lunacy! 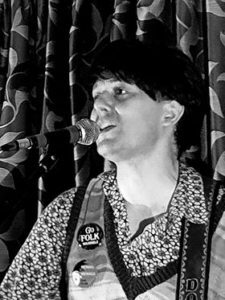 And it’s fair to say Scott didn’t disappoint taking us through a set list of classics, some new songs and some brilliant, but individual covers of songs by artistes that have an obvious influence on Scott. 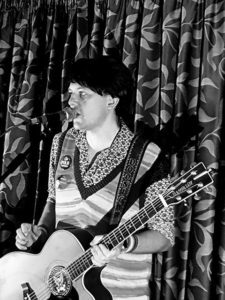 An engaging performer Scott harnesses the theatricality of a Freddie Mercury or an Alice Cooper, the cheekiness of George Formby and the musical hall comedic naughtiness of Max Miller to add to his innocent and self-effacing Barnsley bonhomie, to bring the performance of his songs to a spectacular level. 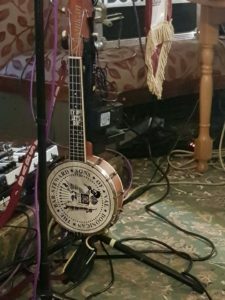 And like some of those stars mentioned, like Freddie or Alice, Scott has that rare ability to perform to a festival crowd or to a small pub audience whilst also performing just for the individual making this one of the most special gigs I have been to in a long time. And as for the songs, The Doonicans, like the very best observational comedians, have a fine eye for the absurd in everyday life. 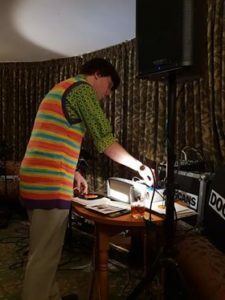 Whether it be the current fashion in eyebrow make up employed by young girls or a meltdown over a bag for life in the local superstore, the Doonican songs shine a light, in a gentle but acerbic way on the sort of mad things that go on in our own day to day lives. Most importantly though, its not done in a nasty way, there’s no pandering to a current climate of offense for offenses case (well, not unless you are a certain Irish rock star and former Glamour magazine Woman Of The Year award winner), as Scott himself says, ‘offence is never given, only taken’ which is the spirit this show should and was taken by the audience. The Scott Doonican One man Show is a joyful, laugh out loud, cry with hilarity and leave smiling tour de force of brilliant observational comedy, exceptional musicianship (with the orchestral backing created by Scott and bandmate Bjorn on their version of The Lady In Greggs being an amazing highlight) and just plain excellent stage performances. 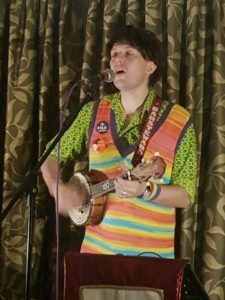 As Eric and Ernie sang, ‘in this world where we live there should be more happiness’ a mantra Scott Doonican has taken on as his own bringing his own brand of sunshine to Warwickshire. Certainly seeing 50 people invoke their inner Morecombe and Wise’s as Scott culminated his show with that famous song was a joy worth the ticket price alone.